Two weeks into the season and local teams are already shining or faltering. Non-conference play continues this week and until conference play begins, teams will be organized alphabetically below within their respective conference. If you aren’t seeing something you want to see, comment below. NSCAA week 1 and week 2 polls have been released since the last Division III soccer post here at PSP. D3Soccer.com’s first poll of the season was released on Tuesday. Penn State Harrisburg: Jon Willingham’s 75th minute goal lifted the Nittany Lions over Lancaster Bible 1-0 on August 29. On Sept, 3, Penn St. continued their winning ways with a 3-1 win over Mt. Aloysius. Wesley: Wesley opened their 2014 campaign with a 2-0 victory over Shenandoah with goals from Shaune Gorman and Danny Ramirez . They scored two more goals on Aug. 30th in a 2-1 comeback win against Cabrini College. A week later Welsey fell to then No. 7 Franklin and Marshall 3-0. York (Pa.): The Spartans have started their 2014 campaign with a 0-1-2 record. Their lone loss came to then No. 10 Franklin and Marshall in a 1-0 scoreline. On Aug. 29, York tied Virginia Wesleyan 0-0 and battled to a 2-2 result against NC Wesleyan. Peter Lundgaard and Joel Teston scored for the Spartans. They found their first victory of the season with a 2-1 victory over Alvernia. Baptist Bible: The start of the season hasn’t been kind to Baptist Bible. Through four games, they have yet to find a win and have only scored one goal. The defenders started their season with a 1-0 (OT) loss to Pennsylvania School of Technology before losing 4-0 to Freedom side Misericordia the following day. Wesley Pincine scored in Baptist Bible’s 4-1 loss to Penn. St Altoona on Sept. 6. Two days later, the defenders struggled against Delaware Valley in a 2-0 defeat. Cabrini: The Cavaliers started their season with a 4-0 win against Penn State-Brandywine with goals from Mohammed Konneh, John Underwood, Sean Neary, and Mike Camacho. Konneh put Cabrini up 1-0 in the 14th minute against Wesley, but the Cavaliers couldn’t hold on a fell 2-1. On Sept. 3, Cabrini pulled off the upset, defeating No. 12 Rutgers Camden 2-1. Bobby Kane and and AJ Bishop scored in the 29th and 33th minute, respectively. Over the weekend, thunderstorms postponed their annual game against across the street rivals, Eastern University, to Sunday. Cabrini fell 3-1 with their lone goal coming from Boomer Steigelman. Cairn: Through three games, Cairn is 0-2-1 and has allowed 15 goals. North Carolina Wesleyan defeated them 7-0 on Aug. 30 before Methodist University dominated the the Highlanders 8-0. They tied Moravian 0-0 on Sept. 3 before their Sept. 6 match against Goucher was cancelled due to thunderstorms. Gwynedd Mercy: Just like Cairn, Gwynedd Mercy is struggling on the field early on. In their opening game, they fell 3-1 to Washington College. Rich Mychack scored the Griffins’ lone goal off a penalty kick in the 23rd minute of play. Gwynedd Mercy lost to both Alvernia 4-0 and to LVC 4-0 this past week. The team looks for their first win with a match against Richard Stockton on Wednesday. Immaculata: The Mighty Macs started off their season with a 0-2-1 record. They lost 2-0 to Alvernia in their season opener and lost 2-1 to Moravian, while playing Albright to a 1-1 tie. Stephen Smith scored against Albright and Matt Dunn gave Immaculata a short-lived lead against Moravian. Keystone: Keystone enshrined their new turf field in a big way defeating SUNY Cobleskill 8-0 in their home opener. Seven different players scored for the Giants. A day later, the Giants fell 2-0 to Lycoming. Eddy Enowbi scored twice in Keystone’s 3-0 win at D’Youville on Friday night before falling to Medaille College 5-0 the next night. Neumann: The Kinghts of Neumann are off to a rough 4-0 start. They finished opening weekend of action 0-2 behind a 2-1 loss to King’s and a 2-0 loss to University of Scranton. Tben Dollie scored the team’s lone goal. The next weekend of action was not any kinder to Neumann. Andrew Kelly and Evan Fahey each scored the first collegiate goals against Gettysburg, but the Knights fell 3-2. No. 1 Messiah beat them the following night 2-0. Dickinson: The Red Devils started their season with a convincing 3-0 win over Catholic. Danny Sheppard, Alred Hylton-Dei, and Drew Carneal scored in the win. A day later Dickinson fell 1-0 to Fredonia. They recovered from their loss with a 4-0 win against and a 4-1 win over Ithaca. In the latter game, the Red Devils scored four unanswered goals to secure their third win of the season. Franklin and Marshall: They are off to a fast start even with many doubting them with the loss All-American forward Ben Beaver to graduation last May. The then No. 10 Diplomats opened their season with a 1-0 upset of then No. 2 Rutgers-Camden. Max Watson scored the game’s loan goal in the 30th minute. A day later on August 30, Sam Lane scored the game-winner in the 1-0 victory over then No. 11 York College. The No. 7 Diplomats continued their success into the second weekend of action with a 4-0 win over LVC and a 3-0 win over Wesley. Their next match is Sept. 13 against Elizabethtown in the annual Smith-Herr Boot Game and look to extend their season shut out streak to five games. Gettysburg: The Bullets began their season with three straight wins. In their season opener, they defeated Wilkes 3-1 behind goals from Sophomores KJ DePontes (2) and Henry Smith. Returning to their home turf, Gettysburg sneaked out a 3-2 result against Neumann. Freshman Patrick Santini scored the game-winning goal with Henry Smith and Mark Yearick adding their own tallies. On the next night, the Bullets hosted University of Redlands. They came away victorious behind a 3-0 scoreline and started their season 3-0 for the first time since 2006. Their undefeated start came to an end on Wednesday when they fell 3-0 to No. 1 Messiah. Haverford: After being down 1-0, the Fords scored three unanswered goals in their 3-1 opening win against Goucher. Haverford continued their success with a 2-1 home opener victory against William Paterson. Brady Seitz and Ben Fields found the net for the Fords. Rutgers-Newark delt Haverford their first loss of the season in the 3-1 result. Maclyn Willigan scored the Fords’ lone goal in the loss. Swarthmore: Ryan Meuth’s first-career goal lifted Swarthmore past Penn St. Abington 1-0. In a rain-shortened match against Berkley, Swarthmore won 3-0 behind two Billy Evers goals. Michael Stewart’s goal pushed the Garnets past Rowan 1-0. Meuth’s golden goal in the 105th minute and two goals from defender Michael Superdock lifted the Ganets to the 3-2 (OT) win against Widener. Albright: The Lions dominated Penn State-Berks 6-0 in their season opener. Vitali Zaluha and Andrew Sussingham led the scoring with two goals apiece. Nathan Hughes’ first collegiate goal secured a 1-1 tie against Immaculata. Albright improved 2-0-1 with a 1-0 win against Wilkes. Austin Phillips scored the game-winning goal. Johns Hopkins dealt Albright their first loss with a 4-0 shutout victory. Alvernia: The Crusaders started their season with two shutouts – a 2-0 win against Immaculata and a 4-0 victory against Gwneydd-Mercy. Alvernia was dealt their first loss against Johns Hopkins in a 2-1 affair before recovering with a 2-0 result against Wilkes. On Wednesday, Alvernia fell 2-1 to York College. Rocky Elgogari scored his season’s third goal in the loss. Arcadia: The Knights have officially kept their opponents of the scoreboard. In their match against Manhattanville, they let up a a first half goal, but the game was called before the half ended. If the game is made up, it will be replayed in its entirety. In their opener, Arcadia tied Marywood 0-0. Matt Ross recorded a goal and his first collegiate assist in Arcadia’s 2-0 win over St. Joseph’s (L.I.) College. They won 3-0 against Newbury and defeated Immaculata 2-0 to improve to 3-0-1 on the season. Lebanon Valley: Alex Detweiler’s goal 3:49 into overtime lifted LVC past Whitman 1-0. After losing against Randolph-Macon 2-0 and No. 7 Franklin and Marshall 4-0, the Dutchmen recovered with a 4-0 win over Gwneydd Mercy. Four different Dutchmen scored in the win. LVC secured a 0-0 tie against Eastern Mennonite to move to 2-2-1. Lycoming: The Warriors are off to an impressive start to the 2014 season. Through five games, they have outscored their opponents 8-0. Their season started with a 1-0 win against Ursinus and defeated Keystone 2-0 two days later. Lycoming’s lone tie came against Susquehanna in a 0-0 affair. They responded with a 3-0 shutout against Pitt Bradford before defeating Penn College 2-0 win. Freshman Abdullahi Abdi scored both goals in the victory. Messiah: For the second straight season opener, the Falcons gave up an early goal but came through with a win. This season Messiah defeated TCNJ 2-1 on Danny Brandt’s game-winner. In a rematch of the 2000 NCAA Division III National Championship where Messiah defeated Rowan 2-0, Messiah dominated Rowan 3-0. The following weekend Messiah looked to avenge old nemeses as they took on Redlands and Neumann. Redlands defeated Messiah 2-1 (OT) in the 2001 NCAA Semifinals, while Neumann upset Messiah 1-0 (OT) in the second round of the 2011 NCAA tournament. This time Messiah prevailed. 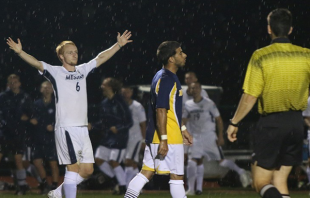 They defeated Redlands 4-0 and Mike Kovach’s pair of goals led Messiah past Neumann 2-0. Kovach’s chip shot over the keeper led the Falcons past Gettysburg 3-0 on Wednesday. Widener: The Pride started their season off strong with 0-0 tie against Penn St. Abington followed by a 1-0 win versus Berkeley and 2-1 win against Ursinus. Swathmore dealt Widener their first loss, 3-2 (2OT), in heartbreaking fashion. Delaware Valley: The Aggies started strong on the road going 2-0-1. They tied Penn St. York 1-1 before defeating Penn St. Hazelton 4-0. Delaware Valley capped of their three-game road trip with a 2-0 win against Bible Baptist. Coming back home, Keystone tripped up Delaware Valley 1-0 and Penn St. Harrisburg prevailed over the hosts 4-1. Eastern: After trio of 3-1 victories against Rosemont, Mount Saint Vincent, and Cabrini, the Eagles were dealt their first loss against Rutgers-Camden 3-1. Misericordia: They opened against Potsdam tied 1-1 after two overtime periods. Since they were facing off in the Plattsburgh Tournament, both teams went to penalties where Misericordia advanced 5-4. The Cougars continued with three straight wins defeating Plattsburgh 2-0, Bible Baptist 4-0, and Ursinus 2-0. On Wednesday, Susquehanna defeated Misericordia 3-0. Catholic: The Eagles fell to Dickinson 3-0 before evening out their record at 1-1 with a 1-0 win over Hampden-Sydney. They fell 2-1 to Washington & Lee before losing to Mary Washington 5-1. Elizabethtown: Scott Hess’ golden goal pushed the Blue Jays past Rowan 2-1 in overtime. On the next night, TCNJ defeated Etown 4-1. A late corner kick and Desales goal forced the Blue Jays to settle for a 1-1 tie. Moravian: After an 0-2 start with losses to Clarkson 2-0 and No. 7 St. Lawrence 4-0, the Greyhounds recovered with a 0-0 tie against Cairn and a 2-1 win versus Immaculata. Muhlenberg blanked Moravian 3-0. Scranton: The Royals started their opening weekend with wins against Penn St. Altoona 4-0 and Neumann 2-0. They lost the following weekend to Rutgers-Newark 4-1 before defeating William Paterson 1-0 (OT). Susquehanna: The Crusaders finished their opening weekend 1-1 with a 1-0 (OT) win against Kean before losing to SUNY Geneseo 2-0. The Battle of the Boot ended in a 0-0 tie against Lycoming. Susquehanna found another win in overtime defeating Jersey City 2-1. The next day Rutgers-Camden handed them their second loss in a 4-0 result. Susquehanna dealt Misericordia their season’s first loss with a 3-0 shutout victory.